There are different levels of white smoke/steam which could be a normal occurrence. A small amount of water is produced as a normal bi product of the combustion process and until the exhaust system warms up the water evaporates and can be seen as steam. When an engine heats up under normal driving conditions the exhaust system will get hot as well. After the engine is shut off and allowed to cool the air inside the exhaust system becomes cooler as well which draws in moisture/water. 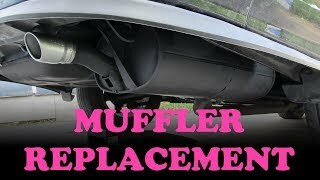 This is normal and is why exhaust systems have small holes at the rear of the muffler to allow water to drip out. When the engine is again started the exhaust system will heat up evaporating the water causing steam. In cold weather a moderate amount of white smoke/steam the first 10 to 15 minutes of run time is not unusual. The image above shows an abnormal amount of steam which indicates a problem. If white steam is accompanied by a sweet or pungent smell it means the engine is burning coolant. This can happen by one for four ways the most popular failures is a blown head gasket which can be tested for. Additional causes include a cracked cylinder head or engine block or the intake manifold gasket failure if it's used to distribute coolant into the cylinder head (engine designs vary). Many times white smoke can begin after the engine has been overheated. Combustion chamber coolant leaks can be tricky because the repairs can overlap and it's difficult to know what the problem is before disassembly in most cases. Example: A repair shop has determined coolant is entering the engine combustion chamber as they disassemble the engine they discover the intake manifold gasket failed. It's up to the honesty of the repair shop to alert the customer the repair will be less than quoted. Or the opposite can happen, example: A repair shop has estimated a blown head gasket replacement for $1200.00 (US). After disassembly they inform you the head gasket is okay and need to send the cylinder head out for pressure testing. The tests come back negative leaving along the engine block as the failure which means it's time for a new engine. If you suspect your car's engine is burning coolant start by checking the coolant level when the engine is cold. If the level is a little low it could be normal but if its way down and there are no coolant leaks it's possible the engine is burning coolant. A chemical test can be used to see if exhaust gases are entering the combustion chamber which is about 75% accurate. If exhaust gases are present nine times out of ten it will be the head gasket (gasket between the engine block and cylinder head). Our team of mechanics is ready to answer your questions for free.